Microsoft packs this little beauty in to your computer with each Windows Update. Simply go to your Start Menu and click RUN (or if you don’t have run just use the search box at the bottom of the Start Menu), type in MRT and press enter. 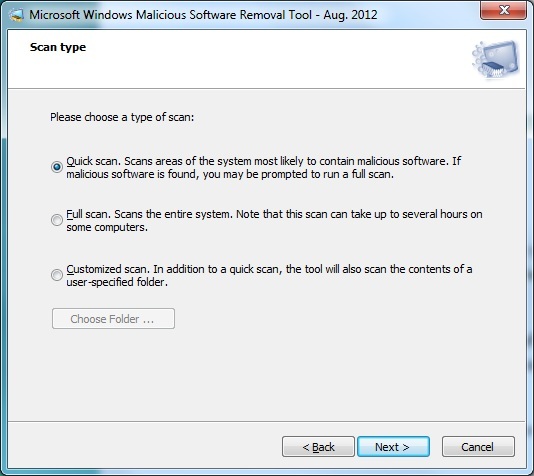 You’ve opened the latest Malware Removal Tool! With a few presses of the next button, you’ll be on your way to scanning your computer for known pieces of malware that can slip right by antivirus and other tools. If you don’t know the last time you’ve run your Windows Updates and you want to ensure you have the latest and greatest version right from Microsoft’s Security Scanner website. Don’t plan to keep this one in your IT toolkit – unlike the download from Windows Update, this download will actually expire every 10 days to ensure you’re keeping a fresh and up-to-date copy with you. So be sure to check your computer for your own safety!